Commonwealth Kia is offering competitive pricing on Kia models during a limited time opportunity. Commonwealth Kia allows drivers to be one step closer to driving the car of their dreams. The all-new 2020 Kia Soul LX FWD is competitively priced at $19,585†. Savings include $500 Kia Customer Cash and $375 Dealer Savings. 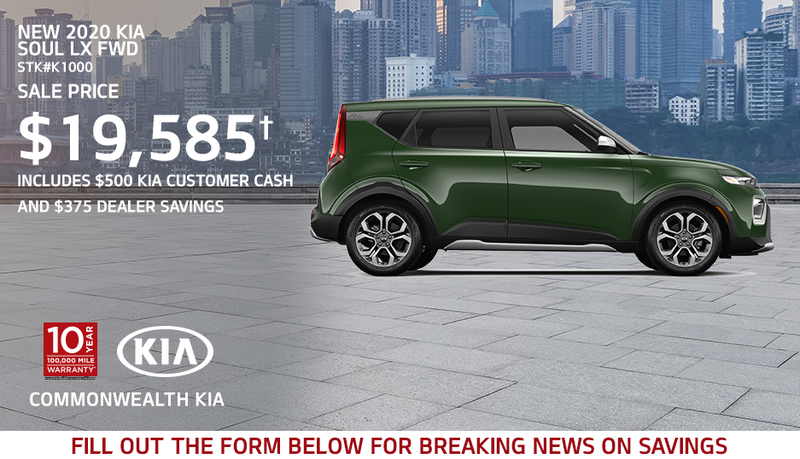 Hurry into Commonwealth Kia, since this offer is only valid until 4/30/19. Contact the dealership or fill out the form located on the page to learn more. The 2020 Kia Soul ranks as one of the top cars in its compact car class according to U.S. News and World Report. The Kia Soul includes a turbocharged engine and a comfortable, spacious cabin. The Soul’s reliability is exceptional. This vehicle seats five in one of the largest and most high-end cabins in a car of its class. Compared to other vehicles in its price point, the Soul utilizes more luxurious cabin materials. Cloth seats are standard in the Soul, though upgrades to leather and leather trim are available. Drivers can keep up to date with an infotainment system presented on a 5-inch touchscreen, Bluetooth connectivity, Siri Eyes Free, and voice recognition technology. Though the 2020 ratings have not yet been released, the 2019 Soul received a five-star overall safety rating from the NHTSA. The Soul also received the Top Safety Pick distinction from the Insurance Institute for Highway Safety. A standard rearview camera helps drivers remain safe when parking and driving in reverse. †Sale price includes a combination of $500 Kia Customer Cash and $375 Dealer Savings. With approved credit. Not all will qualify. Sales price does not include tax, title, license, and all applicable fees. See dealer for details. Offers and incentives may change without notice. Offer expires 4/30/19. *Warranties include 10-year/100,000-mile powertrain and 5-year/60,000-mile basic. All warranties and roadside assistance are limited. See retailer for warranty details.